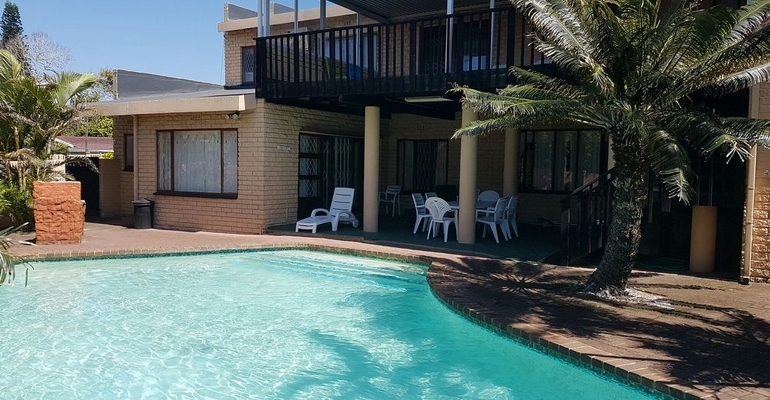 Frere Manor is a self-catering holiday home in Shelly Beach. The venue has 5 Bedrooms and 2 bathrooms and sleeps 12 people. The property has partial sea views from the leisure deck and is just 250m from the beach and just 700m from St Mikes protected swimming beach. For the shopping enthusiasts Shelly Centre is just 200m away with its restaurants, shops and movies. This lovely holiday home sports a well equipped kitchen with eye level oven, washing machine, tumble dryer and dishwasher. There is a separate lounge dining room and TV room with DSTV premium. There is also a double lock up garage, double carport and place for small trailers. The property also has a large swimming pool and entertainment area, is fully walled with burglar bars, alarm and electric fence.